With nearly $30 billion in annual revenues last year, Google needs to keep both dominating search and find new billion-dollar businesses fast. Google’s biggest opportunities beyond search are display advertising, video advertising (YouTube), mobile search, and local. And if it ever gets its act together on social, that could be a wild card. Last October, the company pointed out that its display advertising business (including YouTube) and mobile search was already bringing in an additional $3.5 billion in annualized gross revenues. It wouldn’t take much for local search advertising to become another billion-dollar business for Google. 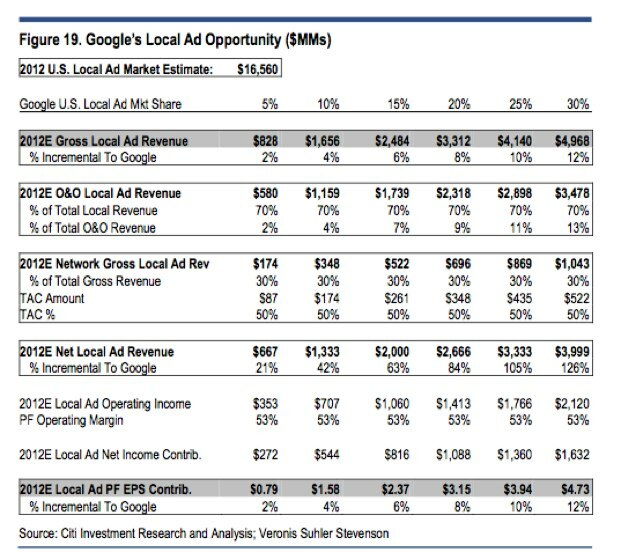 Using an estimate of $16.6 billion for the total local online advertising market in the U.S in 2012, Mahaney shows how different scenarios could boost Google’s bottom line. 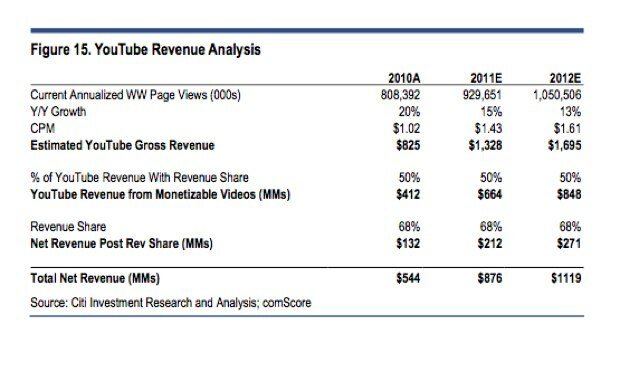 Google only needs to capture 10 percent of that market to add $1.3 billion in incremental net revenue. A 15 percent share would translate to $2 billion in incremental net revenue, and so on (see table below). In addition to YouTube and local, there is the rest of Google’s display business and mobile (which is tied into local to a large extent). Moreover, Citi’s channel checks with search-engine marketers indicate that the core search business remains healthy. He’s very bullish on the stock, putting a $750 price target on Google shares, which opened today at $570 (GOOG). Mahaney notes that Google remains the top source of traffic for 26 of the top 35 Internet properties, and is increasing as a percentage of traffic for 24 of them. And as far as the threat from Facebook is concerned, he writes, “Facebook is not taking share from Search budgets.” At least not yet.